Some people assume installing a fence can be difficult. However wooden sand fencing is one of the easiest types of fence to set up. Below are some helpful tips to keep in mind as well as a graph to help you get the hang of it. T-posts should be placed at a maximum of 10 ft apart from eachother. Vertical strand of fence should be pressed between flat side of t-post & a 1" x 2" wood slat. T-post clips or plastic cable ties are used to secure the slat and the fence strand to the t-post. To connect your fence sections, overlap 2 strand sections from each end and wave a 1" x 2" slat through the overlapping strands. Fence should be tensioned by hand only. No mechanical tensioners, please. 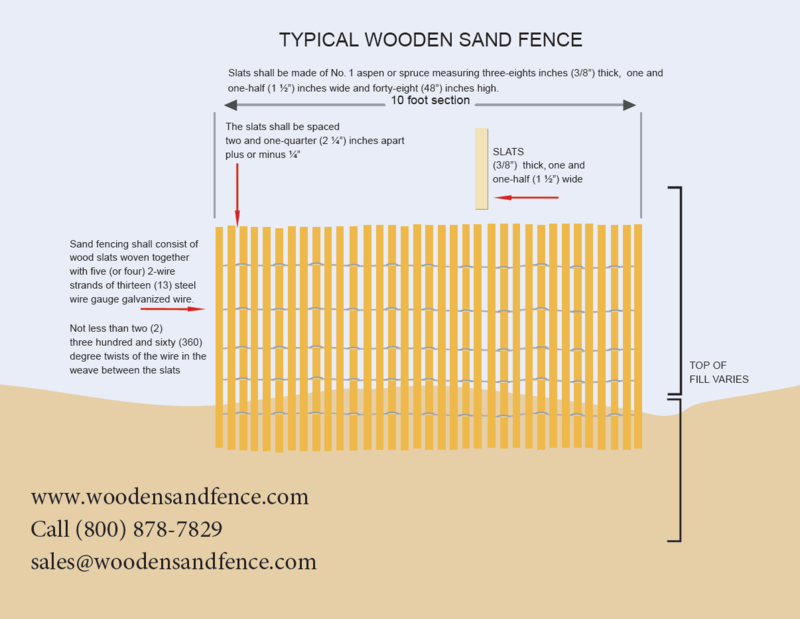 If you have any questions about our wooden sand fencing, or how to install it, don't hesitate to call us toll free at (800) 878-7829 and one of our trained professionals will be happy to assist you.